Web security has become one of the hottest topics of the past few years, with cyber attacks originating in many forms. In 2014 alone, we had the Snapchat hack, Heartbleed, Shellshock, SoakSoak and many other attacks (you can learn more about each of them here). Perhaps the easiest and most popular cyber attack to execute is a DDoS, or Distributed Denial-of-Service attack. 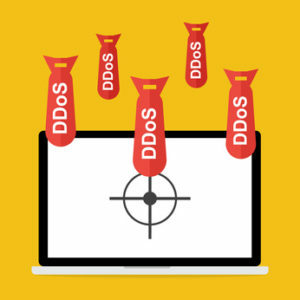 DDoS attacks can dramatically slow your website, and sophisticated attacks can completely crash your website’s server, making it inaccessible to visitors. Have a Paypal account and a target? Then you can hire any number of professional DDoS, or booter, and pay to take a site offline. It’s that easy. How do they work? DDoS attacks usually start with one hacker (or network of hackers) who sets up a network of “bot” computers. The attacker then tells each of the bot computers through any number of command methods to send traffic to a website repeatedly at the same time, which in turn puts excess load on the website’s server. If this network of bots, called a botnet, is large enough, the server load can bring the entire website down. While DDoS attacks don’t expose private data like other hacking methods do, they are still costly to businesses who rely heavily on website advertising, online sales and readership. So much in fact, that a single DDoS attack can cost a company more than $400,000. While DDoS attacks are not preventable, they can be mitigated with SiteLock’s security solutions. These solutions can identify and block malicious traffic such as bots from accessing your website while allowing legitimate traffic in. SiteLock’s Website Security protects companies from all types of DDoS attacks, including the most sophisticated forms with Web Application Protection, Infrastructure Protection and DNS Protection – which are the vital components for comprehensive DDoS protection. To learn more about DDoS attacks and SiteLock DDoS protection, click here.